Combine tea, fruit, and aniseed in a large bowl, cover, and leave overnight or for at least 4 hours. The tea should be mostly absorbed. Grease and flour two 1 lb loaf tins. After soaking fruit, add the walnuts if used and beat in the two eggs. Add the dry ingredients, and beat well with a wooden spoon until smooth. Divide evenly between the two prepared tins (about 14 oz each), decorate with more walnuts if wished, and bake in a preheated oven (Mk 4/350°F/170° – 180°C) for 1 hour, or until done. Leave in tins for about 5 minutes, then turn out to cool on a wire rack. Some like it warm from the oven, but it keeps about a week. * You may need up to 10% more fruit, or liquid, depending on your mix. 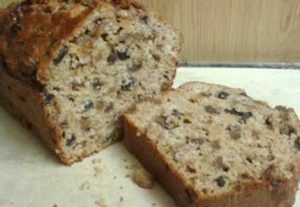 The recipe is based on the standard supermarket mix of raisins, sultanas, currents, and candied peel. Experiment with variations. For example, add more currents if you like it a little less sweet.